The Royal Palace of Madrid is the official residence of the royal family of Spain. 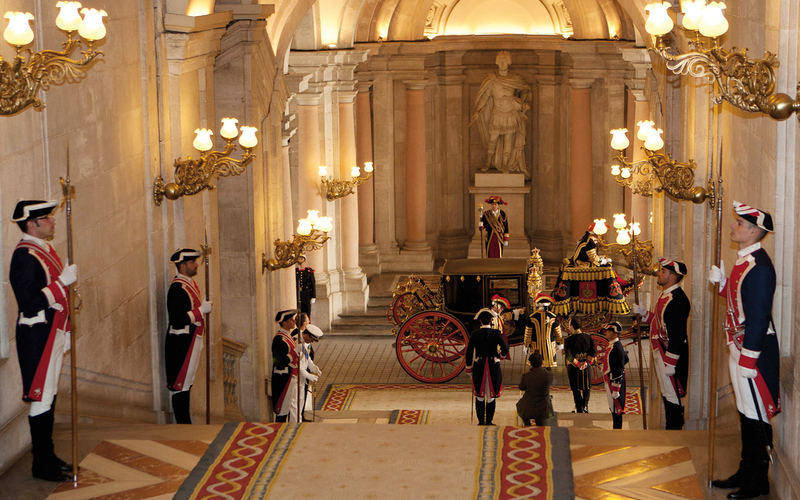 A tour of the Royal Palace is an opportunity to witness the opulence and splendor in which royalty live their lives. The tour will also include visiting the exhibits that include pieces from the royal art collection, and other collections of significant artistic and historic importance, including watches, furniture, and the world’s only Stradivarius string quintet. Make sure that you admire the views of Madrid from this exquisite vantage point before you conclude your visit. Your tour of the Royal Palace should take about 90 minutes, after which you will have plenty of time to wander, shop or grab a bite to eat. Your experience starts off with a walk down the beautiful Paseo del Prado, a beautiful avenue filled with trees and ornate fountains that were given to the capital by King and mayor, Carlos III. The avenue leads to the Prado Museum, and from there you will be diving deep into the cultural and artistic history of Europe by touring through the collection of artwork that is housed in the Museum. Your guide will take you through the museum and highlighting the most famous pieces while providing you the history of the museum and its development. You're free to roam about the museum on your own, after which your experience will end, with you having had your fill of the exceptional art and architecture that Madrid is famous for! Enjoy a guided tour of the Royal Palace, the official residence of the Spanish Royal Family at Madrid. Visit the different chambers of the Palace including the Official Lounges, the Royal Armories, and the Royal Pharmacy. Tour the famed Prado Museum that houses one of the world’s finest collections of European art, dating from the 12th century to the early 20th century. The collection includes almost 20,000 works of art by artists like Francisco Goya, Hieronymus Bosch, El Greco, Rembrandt, Caravaggio, and Diego Velazquez. The tour is available from Monday-Saturday from April 1st to October 31st. It is available only on Tuesdays, Thursdays, and Saturdays from November 1st to March 31st. You will have to meet your guide at 8:30 AM at Opera Station for your tour of the Royal Palace. For your tour of the Prado Museum, you will have to meet your guide at Velazquez Statue at 5:15 PM. We recommend that you get to the meeting points ten minutes before the start of the respective tours. By Bus: Board the #39 to the Opera bus stop. The Opera metro station is in front of the bus stop. The Velazquez statue is right outside the Prado. The museum is centrally located, and a good point of reference is the Cibeles Plaza. Once you reach the Cibeles plaza, you can walk to the museum along the Paseo del Prado. The walk should take you 10 minutes. By Metro: You can take the red line (L2) and get off at Metro Banco de Espana. Alternatively, you can take the Blue line (L1) and get off at Metro Atocha, which is just one station further. 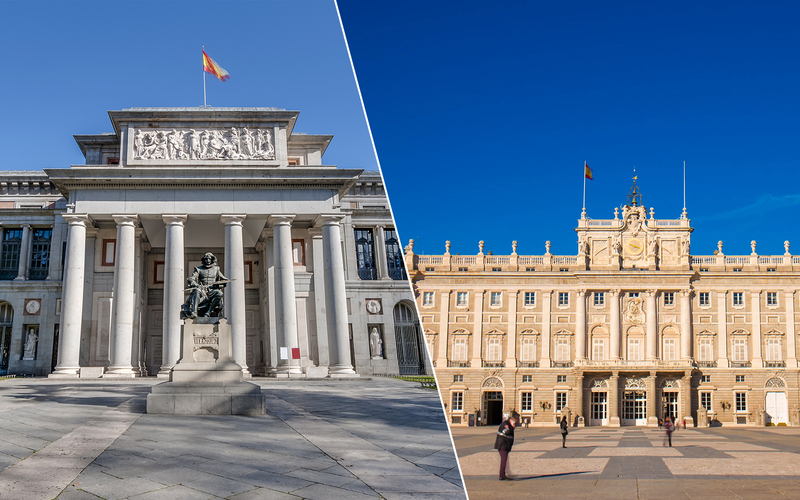 You will receive an email with your Guided Tour of the Royal Palace of Madrid and the Prado Museum with Skip the Line Tickets voucher shortly. Please download and display your voucher along with valid photo ID at both meeting points for both tours. 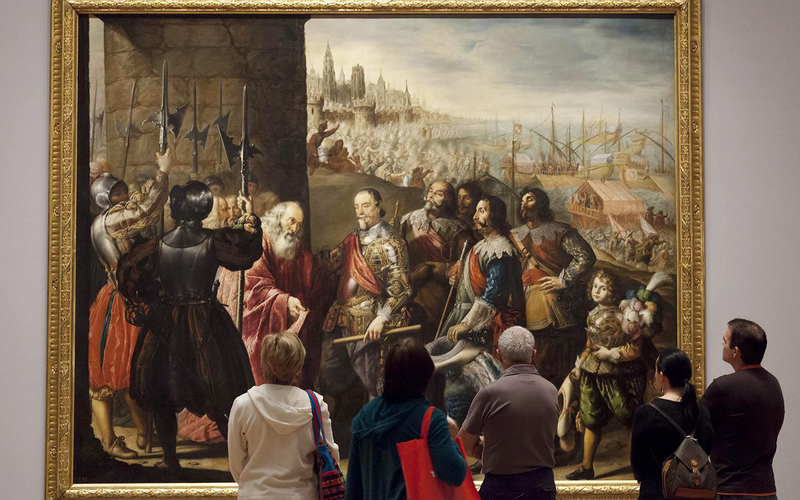 Skip The Line Tickets to the Royal Palace and the Prado Museum. Local Bilingual Guide, conducting tour in both Spanish and English.